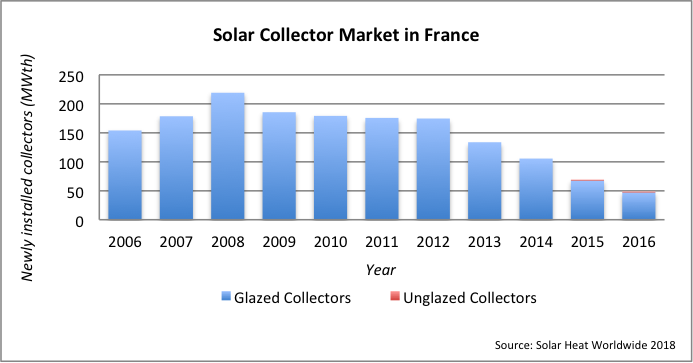 The French solar thermal market has been experiencing a series of difficulties over the last decade. The decrease started in 2009, with a fall in single-family house installations, and has been worsening since 2013, when newly installed solar thermal systems started to decline also on the multi-family homes segment. In terms of volume, the market reached a peak in 2012, with 238 000 m² of collector area installed (167 MWth i.e. 111 GWh) in France (mainland). From then the fall was sharp with only 150,500 m² sold in 2014 (70 GWh) and 66,000 m² in 2016 (31 GWh). Last year’s results reflect a continued drop: only 52 000 m² (36 MWth) were installed, representing a production capacity of 24 GWh in 2017. Overall, France (mainland) has an annual production capacity totaling 1,100 GWh, with an estimated solar thermal collector area of 2,345,000 m² (1 642 MWth). Looking more closely at the product range, a trend emerged in 2017 on the single-house market, with combi-systems (for both domestic hot water production and space heating) riding against the tide: 4,600 m² were installed last year compared to 4,500 m² in 2016. We can only assume that this system is now benefiting from a greater awareness in the market, given that combi-systems yield a higher self-consumption rate than individual solar water heaters, even if their original purchase price is higher. On the downside, domestic solar water heaters remain on a steep downslope with newly installed collector areas down 28% to 18 000 m² on the single-family housing market. Medium- and large-scale systems (both in domestic and non-domestic applications) were down 21% in 2017 to 29,000 m². The collapse of the French solar thermal market can be explained by a combination of several factors. Considering the new buildings segment, the main problem identified by Enerplan (the French trade association of solar professionals) lies within the building regulations: the French RT2012 (thermal regulation for new buildings, dating back from 2012) has less strict standards than the previous regulation in terms of energy consumption thresholds. In essence, the basic demand was originally set at 50 kWh/m². year (multi-family homes), although an exemption was later granted, allowing an extra 15% of energy to be used. This resulted in a reduced need for renewable heat in general out of which solar thermal would be an option, in order to meet legal requirements. This exemption should have been lifted in 2015 but was extended, first to December 2017 and then beyond. With regards to the single-house market, again, low requirements in terms of energy consumption have basically led to a massive shift to DHW heat pumps (thermodynamic water heaters): cheaper as an investment, easier to install than solar thermal systems, they suffice to meet the minimum regulatory requirements. On the top of this, as early as in 2013, errors were identified in the regulatory calculation tool made available to engineers to help them choose the appropriate technologies and products when designing a new building. These errors meant that solar thermal solutions were undervalued by 15% - 18% in the calculations. Although the problem was finally solved in 2017, it has not helped solar thermal much, as it is facing other problems than building rules as well. Although solar thermal systems have the potential to be cost competitive in the long run, initial costs are presently still high (installations are still around € 1,000 per m2), and a lack of interest from maintainers as well as counter references for existing systems (around 150 audits were lead in between 2012 and 2017 which pointed out that only 40% of the systems were working satisfactorily) are still slowing down the market recovery. Engineers need to be informed about market innovations and performance data, since they are still reluctant to prescribe these solutions because they have doubts about the cost effectiveness in the long run. Nevertheless, some grounds for hope can be found in recent developments. To start with, a law passed at the end of 2016 enables local authorities to grant larger surface occupation ratios in building permissions for projects in which energy consumptions are 20% lower than required by the RT2012 regulation. A study by Crigen engineers (Engie R&D Lab) published in early 2017 ("Positionnement technico-économique RT 2012 des solutions solaires thermiques et concurrentes en secteur résidentiel dans un contexte de bonification du COS") established that solar thermal technology is one of the few technologies that can meet this lower level without having to increase the building’s insulation, anywhere in France (for more details see the French SOCOL leaflet published in 2017, "Solaire thermique, la nouvelle dynamique"). Also, reaching a lower level of energy consumption opens the way to grants from the ADEME agency, even for new buildings. Finally, the new experimental E+C- (Energy +, Carbon -) government label, paving the way to the next set of thermal regulations into 2020, should benefit solar thermal systems as its application should result in a low carbon impact. Please refer to the French SOCOL leaflet: "Rénovation + solaire thermique, la nouvelle dynamique" for more details. Finally, part of the decrease can be explained by the lack of knowledge of potential customers (both for housing and commercial uses) for solar thermal technologies and a lasting confusion with the more popular photovoltaic applications. This weakness has been further worsened by a drop in confidence from buyers and investors. This is due to the fact that communications about some faulty or failing installations have hampered trust in the industry: indeed, the French market went through a period of quick and strong growth from 2006 to 2012. During these years, high demand had to be met by a limited number of professionals who had, until then, been trained and equipped to provide the needs of a very small – if not niche – market. This resulted in a shortage of qualified specialists and a lack of quality control procedures. Since then, the industry has worked hard to achieve better standards (new qualifications, new technical and legal procedures...). However, work still needs to be done to restore complete confidence in the technology. The SOCOL taskforce, initiated by Enerplan in 2009 and financially supported by ADEME, has been working toward this goal (see further down: Other Key Topics). Prospective buyers and project owners need to be informed on the progress made by the whole of the solar thermal industry, particularly in the last 5 years. It is also crucial that they should be informed of all the free tools and advice at their disposal on the SOCOL website to help them with their project. In this context, the French energy roadmap (Programmation Pluriannuelle de l’Energie or PPE) has set targets for the development of renewable energy, including solar thermal. The target set for 2018 was an installed capacity of 4,500,000 m²: only about half of this figure is likely to be reached by the end of 2018. Original goals for 2023 were to reach a total collector area between 6,700,000 m² and 9,900,000 m² - this would mean multiplying by 3 or 4 the current installed surface. The industry believes that it is still possible to get closer to those ambitious figures when certain measures and changes in building regulations are implemented. If no favorable decisions are made to enhance the attractiveness of solar thermal in France (more communication, more training, more incentives, changes in regulation), the solar thermal DHW market should grow by no more than 60,000 to 90,000 m² per annum. However, installations in the emerging segments (industry and solar district heating or SDH) are estimated to represent a potential of 300,000 to 500,000 m² (cumulative installed base), to be installed by 2023. This figure, though certainly very ambitious, shows a real potential which has not yet been exploited. Historically, solar thermal technologies in France have been mainly used for small domestic hot water systems in the single-houses market and applications in the tertiary sector. However, a turn was taken in 2012: a new trend emerged on the market. Before that year, single-family home installations represented the largest market share. Since 2012, the medium- and large-scale systems (mostly installed in multi-family homes and with a typical surface between 25 to 50 m²) have started to claim a larger share of the newly installed collector area. This trend has remained since and 2017 was no exception with almost 60% of the market dedicated to medium- and large-scale systems. However, within this segment of larger solar thermal installations, another change has been taking place over the last couple of years with the emergence of new markets, i.e. industrial applications and solar district heating. Although these segments are not new in Europe (cf. for example the Danish, Austrian and German markets), they are just starting to develop in France. With regards to solar district heating (SDH), installations started back in 2013 with the launch of a relatively large system (for French standards) of 1,500 m² near Paris, and progressed in 2014 with three new systems, all of them located in the southwest of France (Occitanie) and covering relatively small collector areas (250 m², 300 m² and 450 m²). The largest public SDH system to date was inaugurated at the end of 2017 in the small town of Chateaubriant (western France) and totals 2 200 m² of collector area. In the eastern part of France investments in SDH have also started with a first, small, installation soon to be launched in Voreppe (Auvergne-Rhône-Alpes Region) of 200 m² and more will follow since this region is currently involved in the European SDH p2m project. Indeed, 10 out of the 180 regional district heating networks have shown an interest in adding solar thermal energy to their mix and 3 cases are being studied. In this region alone, the potential installation area is estimated between 400,000 m² and 1,600,000 m² (based on solar thermal contributing from 5% to 20% into district heating networks). It may also be worth noting that the French army has started taking interest in SDH technologies with a first installation now working in the south of France (Vaucluse). This system uses parabolic troughs (2,500 m²) to produce an estimated 466 MWh per year. In summer, the network is fed solely by solar thermal energy. Industrial applications also represent a promising market segment for solar thermal technologies in France. ESCO companies have either emerged in recent years or started adding solar thermal solutions to their product portfolio. In 2014 and 2015, two newly-founded specialised French companies began offering solar thermal as a means to challenge the rising cost of energy in the industrial sector. Both target large-scale installations and offer an energy supply service in which the industrial customer does not invest in the system but rather agrees to purchase a minimum quantity of solar heat at a given price for a number of years. The solar thermal installation can be acquired at a predefined price at the end of the contract. Some projects are now starting to emerge, including a rather large installation of 4,000 m² in the paper industry that started construction in March 2018 in the center of France (Condat). Another project is underway in northern France for industrial vehicle cleaning. Moreover, existing solar thermal manufacturers and large maintenance companies have also begun to offer either leasing solutions or complete energy supply solutions including solar thermal. At this stage, it is reasonable to assume that the future trend on the French solar thermal market will continue to develop in favor of larger-scale systems. Finally, it is also to be noted that solar thermal air-conditioning solutions, on the contrary, can still be considered very much a niche market. Environmental awareness has not been the main market driver in France so far except for a small fraction of the population. The decision to invest in a solar thermal system in all market segments is mainly motivated by return on investment, although recently the concept of self-sufficiency has also been developing, probably in the wake of the photovoltaic concept of « self-consumption », which is becoming increasingly popular. A look at the market over the last 15 years shows that solar thermal installations have developed at their highest rate when the previous building regulations applied – it was more demanding in terms of energy generation than the current one, and solar thermal was needed to meet its requirements. Therefore, favourable building regulations and higher fossil fuel prices are key market drivers and, as at 2017, both of these market components are not set in the right direction as they are currently pulling the solar thermal market down (low fossil fuel prices, and a building regulation that does not call for the use of renewable heat in general). Finally, more needs to be done in terms of communication and training, including at a regional level: local energy advisers, in particular, seem to lack sufficient knowledge of solar thermal. A national communication campaign targeted both at the general public and at professionals, could certainly help. Since the 1970s, France has benefited from a solid domestic solar thermal manufacturing base, although it has weakened over the last ten years. The total market value generated by solar thermal activities in France was estimated at 541 M€ in 2012, down to 319 M€ in 2016 (source: Marchés et emplois dans le domaine des énergies renouvelables, situation 2013-2015 by ADEME). Historical industrial players like De Dietrich (now BDR Thermea), Giordano Industries (although now more focused on solar heat pumps technologies), Vaillant and Viessmann are still active on the market, which has welcomed more manufacturers (of either complete systems or components) over the decades (Atlantic, Baxi, Bosch, Eklor, EnergyConcept-Sonnenkraft, Heliofrance, Solisart – focused on combi-systems, Weishaupt, etc.). Hybrid system manufacturers (PV + thermal) have also entered the market since the turn of the new century (DualSun, Systovi, GSE, etc.). An estimated 4,150 jobs were linked to the solar thermal sector in France in 2012. The figure was down to 2,220 in 2016. It is interesting to point out that the number of jobs linked to export have remained stable (from 530 to 520) over the same period of time. The drop is therefore exclusively related to the fall of domestic sales. A study was carried out in 2017 by I-Care & Consult in France (Compétitivité de la filière solaire en France), to assess competitiveness on the French solar market (considering both solar thermal and photovoltaic). This study was updated in March 2018 for the solar thermal industry. The 2018 results take into account the expected increase in the CO2 cost ("carbon tax": French CCE). They show that solar thermal systems are already becoming competitive (with subsidies) when compared to other energies, considering the full cost (i.e. including Operation & Maintenance) over 20 years, everywhere in France, . These results demonstrate that looking over the next 20 years, it is now (or will soon be) more expensive to keep an existing boiler than to add a solar thermal installation to produce DHW. With regards to single-family homes, this will be true from 2020 onwards in the south of France (with the cost of hot water estimated at € 8,057 for an individual solar water heater vs. € 8,421 for a gas boiler). As far as multi-family housing it is already the case in 2018, everywhere in France (see above). France boasts a specific programme, dedicated to solar thermal for multifamily housing and for the tertiary sector, called SOCOL. SOCOL stands for "SOlar (thermal) and COLlective": initiated by ENERPLAN in 2009, SOCOL is a collaborative platform gathering specialists, professionals and institutions operating within the solar thermal market in France. Dedicated to promoting multi-family and commercial solar thermal systems, SOCOL is representative of the industry with almost 3,000 members. Addressing solar thermal experts and project-owners alike, SOCOL consists of working groups manned by solar thermal specialists, who regularly produce documents and tools (such as software) and make them freely available online. For years, French experts working with SOCOL have been providing free access to technical and pedagogical tools, in order to help achieve successful large solar thermal installations in the residential and tertiary sector. These tools now cover every step in solar thermal projects, from conception to daily maintenance, ensuring peace of mind for project-owners and good performance during the lifespan of solar thermal systems. Access to the site and its tools is free of charge. The SOCOL team within Enerplan and in partnership with other entities such as Uniclima (the French union for heating, refrigerating and freezing industries) and Qualit’EnR (qualification and certification organisation for renewable energy professionals) are also dedicated to disseminating good practices, guidelines and tools for «zero default» installations, as widely as possible and collaborating with numerous partners both at the national and regional levels. The SOCOL website provides help to project-owners and professionals and answers the following questions: what is solar thermal, which various technologies are available and how to choose between them, what is provided on the website to help throughout any project… Technical and informational data sheets, as well as specific software and legal material, can be found on the website along with videos and information relevant for each French region. Recent add-ons include a complete (technical and legal) set of guidelines regarding the specific requirements for solar thermal installations operations after the placed-in-service date and how to ascertain their performance before the maintainer takes over. This method has been developed by SOCOL and can be referred to as Dynamic Commissioning (“Mise en Service Dynamique” in French). It aims at providing an accurate definition and a precise log of all technical steps along the project, from design and engineering to the start of maintenance. It includes checking if the installation was realized in line with the requirements, and a surveyed period of three to six months after the initial system run, thus ensuring that its performance matches the expectations. This official requirement represents a major recognition of the important benefit provided by the SOCOL method, to ensure quality all the way through the project. Another useful result is the recent database produced by SOCOL which provides a listing of tele-monitoring services available in France. The database also covers systems with tele-monitoring capability readily integrated during the systems’ production. Monitoring has been recognized as essential to ensure long-term performance and cost effectiveness of solar systems. The SOCOL team works closely together with all involved in solar thermal activities and promotion. The French union for heating, refrigerating and freezing industries (Uniclima) is a close contributor and actions are often led in collaboration with them, as it represents the French manufacturers. In the coming years, SOCOL is committed to continuing its actions to secure, promote and develop solar thermal technologies on the French market. Following the 2013 competitiveness study, the French solar thermal industry has been executing an action plan since 2014, which focusses on the marketing of solar thermal, on the performance and the quality of solar thermal systems and which will address R&D needs. France does not specifically endorse solar buildings through its energy and building policies. Policies are generally aimed at making existing buildings more (primary) energy efficient (by improving insulation standards and by installing efficient energy systems, i.e. renewable based systems) and by imposing strict primary energy consumption criteria for new buildings (typically a maximum consumption of 50 kWh/m².year). Solar thermal systems represent one of a series of options available to meet these requirements. Solar buildings (or bioclimatic homes) are being promoted via the renewable energy observatory (Observatoire des Energies Renouvelables) and their contest called "solar architecture, today’s architecture" (architecture solaire, architecture d’aujourd’hui) that takes place every other year and selects remarkable solar homes. Some solar homes can also be encouraged while seeking to obtain Effinergie (French association acting for the development of energy efficient buildings) or HQE (high environmental quality) labels. Solar thermal panels on trackers (The OPTISHIP R&D program (“Optimized solar heat for industrial processes”) conducted by newHeat). France takes part in several ongoing international R&D programs from IEA SHC including Task 51 (urban planning), Task 53 (solar cooling), Task 54 (cost reduction), Task 55 (large SHC), Task 58 (storage), Task 60 (PVT). The ADEME agency (French Energy & Environment Management Agency) also promotes R&D by co-financing specific research programs led by manufacturers and engineering companies, among which the SySTEff project aiming at reducing the cost of combi-systems, the RESIST project directed at developing a new generation of monitoring systems but also the SCRIB or PVCOOLING projects focusing on the development of innovative solar thermal and solar PV cooling systems, and the STRATOCLAIR project addressing a new concept for low cost SDH system for single-family homes. Universities such as MINES Paris Tech also work on developing new technologies to enhance the productivity of solar systems (for example the CRESUS system, designed to use weather forecasts to monitor individual solar water heaters). France owns several R&D infrastructures specialized in different fields: solar collector testing in Perpignan (CESP University of Perpignan), in Lyon (CETIAT) and in Chambery (INES) and solar controller testing as well as solar cooling machine testing (CEA) in Chambery. In the private company sectors, several companies have their own testing devices at the component level or system level, such as the Viessmann company in Faulquemont. Research programs run on a number of topics: storage, collectors for heating network, solar cooling, etc. The current French energy policy was first based on the “Grenelle Law” (2007) and is now developing in the legal frame of the Energy Transition for Green Growth Law (passed in 2015). One of its objectives is that renewables should represent 32% of final energy consumption by 2030. Today, solar thermal is supported by the government through financial incentives. Two types of financial support are in place. One scheme is designed for individual solar thermal systems (tax credit) and another one is dedicated to collective solar thermal systems (see below). This financial measure is a tax credit for homeowners and is not an actual reduction of the tax. Therefore, people who do not pay taxes can still receive a payment. The tax credit has been revised and harmonized and amounts to 30% of eligible costs for solar thermal water heaters or combi-systems in 2018. The French Heat Fund subsidizes projects for collective hot water systems for multi-family homes, in the tertiary sector and the fields of agriculture and industry. The subsidy level should allow the costs of the exploitation of solar systems to be slightly below those of “standard systems”. With the RT2012 regulation now well in place, only projects for existing buildings are eligible to the Heat Fund (unless they reach an overall energetic performance higher than the requested level). Furthermore, a minimum surface of 25 m² of collectors is required for a project to be eligible. Large-scale projects are subsidised thanks to a specific scheme within the Heat Fund to help develop bigger systems mainly targeting district heating systems, as well as the hot water needs of collective housing, industry, the tertiary sector, agriculture and the food processing industry (https://appelsaprojets.ademe.fr/aap/AAPST2018-27). Heating and cooling solar systems are not eligible, however, some projects in this category can benefit from monitoring campaigns (New Emerging Technologies Fund “NTE”) which seeks to better understand their energetic and economic potential.